The origins of the 90° dial have been accounted for in various ways by various people. In the 20th century, according to available documents, the 90° dial was first used by practitioners of Hamburg School astrology, i.e. by followers of the teachings of the innovative astrologer, Alfred Witte. Ludwig Rudolph, one of Witte's most enthusiastic and dedicated students, used the 90° dial in his astrological practice, as did cosmobiologist Reinhold Ebertin. Use of such a tool, or the principles it is based on, prior to the time of Witte, Rudolph, and Ebertin is not impossible, yet it is primarly Rudolph and Ebertin who popularized its usage in recent times. 2) increase × 4 the amount of space between degree markings so that planetary positions could be located visually with greater precision. 3) ease and expedite locating 45° and 135° angular relationships (8th harmonic), which also proved themselves to be more dynamic and productive than the "soft aspects" of other astrological traditions. Note that when arriving at 90° and any of its multiples, the scale starts again at the beginning. Now, note also, that in dividing the 12 signs of the zodiac by 4, we end up with sections consisting of 3 signs, and 3 × 30° = 90°. And the fourth round on the 90° dial consists of 0° Capricorn through 29°59' Pisces (i.e. 270° to 359°59'). This can be summarized in other words -- each round of the 90° begins with 0° of a cardinal sign (Aries starting at 0°, Cancer at 90°, Libra at 180°, and Capricorn at 270°). Prior to the time when astrologers had computers to draw 90° charts automatically, Hamburg, Cosmobiology, and Uranian astrologers plotted the planets and points around the chart by following the above considerations. With the computers we have today, such calculation is no longer necessary; yet we still need to understand the underlying principles. At this point, we have a basic summary of how the 90° dial works, and if it is not clear to you at this point, you should return to the beginning of this article, and study the comments while referring to the linear graph above, which enumerates the 4 rounds of the 90° dial, totaling 360° in the traditional zodiac. Now, as it was mentioned earlier, the 90° dial also makes it easy to locate 45° multiple angles, which correspond to the 8th harmonic (45°, 135°, 225°, and 315°). It is not unlikely that when traditional astrological conventions were established by Ptolemy, those aspects which were not multiples of the 30° span of the zodiacal signs were eliminated for ease of calculation. From the standpoint of Hamburg School astrology and its offshoots, a very important component of astrological delineation was lost in the process. The 90° dial, however, makes these 45° multiple angles once again easy to locate.... they show up as "oppositions" at 45° on the 90° dial (whereas all 90° multiple angles show up as "conjunctions" on the dial). Thus the 90° dial once again brought the important 8th harmonic angles back into consideration, revealing major personal talents indicated by the natal chart, and major events triggered by solar arc directions and transits, all in a quickly and easily detectable format. Last, but not least, the 4th harmonic midpoints show up readily on the 90° dial, which is numbered symmetrically from 0° to 45°, to both the left and the right, as shown in the diagram to our left. The inside circle, numbered from 45° to 90° may strike your curiosity. This additional row of numbers is primarily for calculating solar arc directions past the age of 45, and for drawing 90° horoscopes manually, and is of no great significance in calculating midpoints alone. The newer, advanced use of the 90° dial is slightly more complicated, but not difficult once you become accustomed to using the 90° dial. Hamburg School astrologers, including Ludwig Rudolph and Ruth Brummund, took further note that 16th harmonic angles, i.e. half of the 45° (8th harmonic) multiples, the 22.5° angles, were also highly significant in both natal charts and in directions and transits, accounting for talents and events that might not otherwise show up. Using a traditional 360° horoscope, these would be extremely tedious to calculate... but with the 90° dial, not so: they show up at right angles to the main pointer, and include the 22.5° angle and all its harmonic multiples. You can see on the chart and dial below how they all line up at the 1/4 and 3/4 markers on the 90° dial (shown on the chart beneath the small " v " in the top row, and on the dial with the "East" and "West" pointers. Those more advanced astrologers who also work with the 22.5° angles further fine-tune and turn the dial 1/4 turn so that 22.5 is set to the planet whose midpoint axis is being investigated, and a further set of highly pertinent midpoints is revealed. The most experienced astrologers may do this visually without actually turning the dial. * Footnote: "Evil" or "malefic aspects" are one of the many leftovers still perpetuated by some contemporary astrologers. Such concepts were perhaps suitable for describing dynamic tension aspects in Ancient and Medieval times, when the average person was bound by feudal social orders and caste systems and less likely to have control over their own lives and destinies. The negative concept of "malefic" or "evil aspects" are, however, unsuitable for building and cultivating a society of free individuals where adversities are seen as challenges to personal growth rather than fated, insurmountable setbacks and annoyances to merely be suffered or passively tolerated. The original Hamburg School astrologers set the pace in popularizing this realization among post-19th-century astrologers. 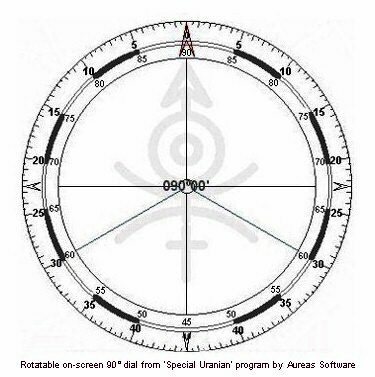 > TO PROCEED TO THE LESSON ON 22.5-DEGREE (16TH HARMONIC) ANALYSIS USING THE 90-DEGREE DIAL, CLICK HERE. > TO RETURN TO THE BEGINNING OF THE INTRODUCTORY LESSONS ON URANIAN ASTROLOGY, CLICK HERE.